The New Theatre, East Essex Street, Temple Bar. Stories and strangeness abide here. We are slaves to both. Three stories; love and horror, humour and hate. The Risky Proximity Players have come to share them with you. Have you lost something? Did someone get swallowed and disappear in the dark? Well come on down for the one-night performance of Francie & Dennis. No refunds. No guarantee of catharsis. She came from Outside. She knew places he’d never heard of before – Drumcondra Road, Cabra, Fassaugh Avenue. Exotic places, a full forty minutes up the road. It would not, could not last. Three stories of love and loss, presented to you without comment or hope. Fresh from their sell-out show High Five, Danny O’C! 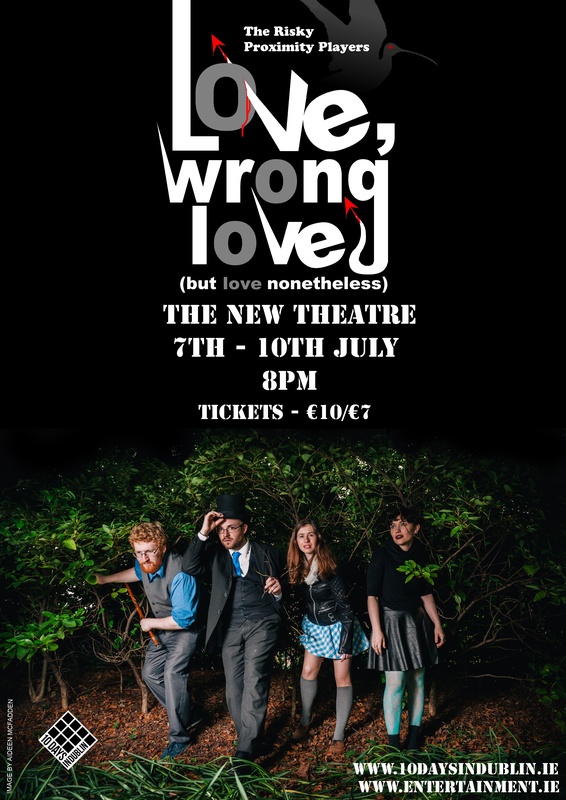 the Risky Proximity Players bring you Love, Wrong Love (but love nonetheless) as part of the 10 Days in Dublin festival. Starring Graham Tugwell, Sinead O’Brien, Dave Rudden, Deirdre Sullivan and Amy Flood.